Abilene City Hall is located at 555 Walnut Street, Abilene, TX 79604; phone: 325-676-6200. Photo: Eugene L. Finley House, ca. 1903, 208 Merchant Street, Abilene, TX. Listed on the National Register of Historic Places in 1992. Photographed by User:Randydodd (own work), 2012, [cc-by-3.0 (creativecommons.org/licenses/by/3.0)], via Wikimedia Commons, accessed August, 2014. Since the latter decades of the 19th century, the city of Abilene has been an important center of trade and has become known because of its educational and church advantages, its railroads, its large local and wholesale business, and its excellent municipal improvements. Founded when the Texas & Pacific Railroad was built, its population in 1890 was 3,194; in 1900, 3,411; and in 1910, 9,204, so that at the present time more than a third of the county's population live in the chief city. A visitor at Abilene in May, 1881, described the town as follows: "Three months ago Simpson's ranch was the only house in this country where the weary cowboy could find shelter. Not a tent had been stretched, and nothing but the bark of the prairie dog and the lowing of cattle disturbed the stillness. Now a city of 1,500 people adorns the broad level prairie. There are wholesale and retail stores, commission houses, hotels, churches and schools, a fine water supply and this is a distributing and trading point for Buffalo Gap, Phantom Hill, Fort Concho, and other government posts. The railroad depot was found to be inadequate to hold the goods brought for shipment and tents had to be stretched to shelter them. This is a cattle shipping point, but the farmers are already beginning to encroach." Since 1888 Abilene has been the county seat. It has recently been organized under a commission form of government. 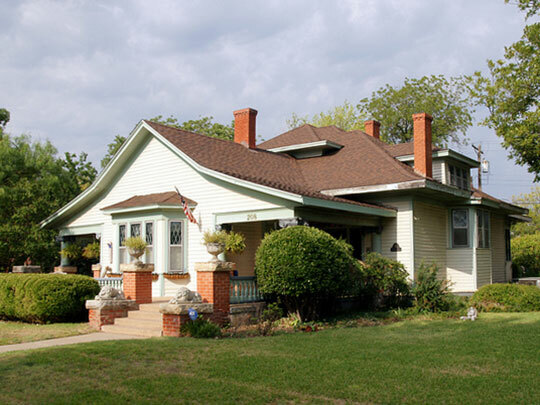 Abilene has waterworks, has paved streets in the business section, a sewer system, a street railway, electric lights, and arrangements have been made to introduce natural gas from the Moran fields. Besides its business and municipal advantages it enjoys a reputation as a college and school town. Simmons College was established there in 1892, under the auspices of the Baptist church, and is now regarded as one of the best equipped small colleges in the state. The Abilene Christian College was founded in 1906, and there are several other private schools. The public school system comprises a fine high school building and four ward schools. Near the city is located the state colony for epileptics, which was established by virtue of an act of 1892. Frank W. Johnson, Eugene C. Barker, Ph.D., editor and assisted by Ernest William Winkler, M.A., A History of Texas and Texans, Volume II, The American Historical Society, Chicago and New York, 1914.